A Barnsley Historian's View: So Many Different Kinds of History ... but let's all pull together! So Many Different Kinds of History ... but let's all pull together! But in the last week or so I've feel as if I've been assaulted on all sides by lots and lots of different viewpoints on history (or should that be HISTORY) in Barnsley. As I'm quite keen myself I'm not about to give up on my own hobby, but sometimes I do want to crawl into a handy hole (preferably still with internet access and somewhere in the vicinity of Barnsley Archives) and shut everyone else out - at least until there is some kind of general consensus. Last week the Cudworth History and Heritage Group, which I attend twice a week, took a stand at the Thurnscoe History Day. I understand it was a quieter day than some in the past, however the usual several parties of school children visited which surely makes it all worthwhile? One visitor spent ages talking to one of the Cudworth members about his family history - if we helped just one person in their hobby, that's a good thing isn't it? And yet one member of the CLHG, who shall remain nameless, suggested that they should not bother to attend the event in future years because it had been so quiet. Oh, dear. Experience Barnsley in the process of hosting various Roman related activities, which again attracted dozens of children ... next year they are planning an exhibition on the Miners' Strike. This is surely wonderful, we should all be supportive of their work to bring a greater awareness of the history of Barnsley. And yet I have heard people who haven't even visited the museum complaining about the displays and the money (Lottery money by the way, not rate payers' money) that was spent. Oh, please, just be happy that we have a brilliant new museum that is attracting thousands of visitors every week. Some of them will shop in Barnsley, eat in Barnsley and buy a coffee/beer in Barnsley! The displays will be changing every three to six months, so even those of us who have been will have to keep going to see what is on display next time around. On Saturday I attended an event organised by the Oral History Society and facilitated by Michelle Winslow, an oral historian and research fellow at the University of Sheffield. Again apart from the speakers, some inspiring volunteers associated with various hospices and one lady from the NUM it was very sparsely attended. However for those of us who did attend it was very, very interesting. John Tanner outlined how Experience Barnsley use oral history in their displays; the audio tracks in the listening stations are stored on memory cards so can be easily changed and the voices refreshed with the rest of the displays. Richard King from the Dearne Valley Landscape Partnership explained how they will be working to preserve and interpret the landscape that we take for granted by involving the communities in the Dearne Valley. Kate Burland, from the University of Sheffield, gave a short version of her recent talk about the unique dialect in Royston, Barnsley. It's all due to the influx of miners from the Black Country and Staffordshire in the late 19th century. By 1901 over 50% of the heads of household of Royston were from that area - it's no wonder there was a effect on the way the next generation of residents spoke that has been carried down to the present day. David Clayton from the Shaw Lane Peoples Sport Project spoke with great enthusiasm about the venue and their future aims. Did you know it was an Olympic training area for Archery? Wow!! The Project has received some Lottery Funding to conduct a project on the history of the site - How did it get there? Who used it? He asked particularly for memories from people who, as school children, attended the School Sports Day events at Shaw Lane. Over 40,000 children took part in these events down the years - there must be so many happy memories out there. After lunch Dr Charles West from the University of Sheffield shared some lessons on setting up an oral history project. He works with student volunteers, who in their own time conduct oral history interviews with people in Sheffield. The recordings are keyworded and will shortly be available on a website for anyone to search. As he put it, "Twenty students a year each carrying out two interviews, that's over fifty interviews already, and it will grow and grow to be an important resource on the history of Sheffield". Topics covered so far have been 1980s Sheffield and the Sheffield Blitz. Macmillan Cancer Support organise volunteers to work in hospices and with cancer sufferers in palliative care to record their memories for their families - some of this is not nationally important history, but to the individuals and their children and grandchildren it is a wonderful way to commemorate their lives. And yet ... and yet ... towards the end of the meeting we started to discuss how all these different groups make recordings of the memories of our local history and we realised that there is no central 'hub' for accessing them. The projects are all disparate. You might know about one but unless you attend events like this you wouldn't know about them all. I mentioned the Imperial War Museum's audio archive, which I've found contains some wonderful recordings made by Barnsley folk by Jon Cooksey when he was preparing his Barnsley Pals book. Follow my link and listen to the stories of men who fought for us nearly 100 years ago! Today I was upset to find that Old Pictures of Barnsley, a well meaning Facebook page with thousands of uploaded pictures donated by local people, had miscopied some information from one of my own blog posts along with two images that I had properly credited, but without mentioning the source of the information or the images. The administrator did apologise as soon as I pointed this out - but the volunteers on there don't fully understand copyright - I know I'm skating a bit close to the edge myself in some of my blogs, but at least I provide links and references to the original sources of my information and pictures. Hopefully they now understand that crediting the brilliant Yococo website (which belongs to Barnsley Council) is a positive thing to do as it opens out the thousands of images on there to all their viewers too. Finally I began asking a few weeks ago about information on War Memorials in Barnsley. 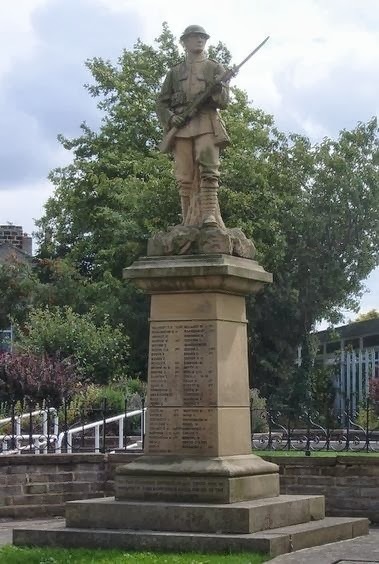 I would like to pull together a bit of a talk for the Friends of the Archives about not one memorial in particular, but rather about the whole topic of commemoration in Barnsley in the period towards the end and just after the First World War. Already I have discovered along with another enthusiastic volunteer that there is no central "Roll of Honour" in existence for Barnsley. We know that thousands of men were killed and injured ... but we aren't sure who they all were. Each community in Barnsley commemorated the war in its own way, some decided to dedicate parks or village halls or cottage homes rather than erect the now familiar war memorials. As a consequence of these many separate projects the names of many of the lost were not recorded centrally as they were in, say, Sheffield. However finding out who has recorded or researched what seems to be constantly in danger of 'treading on toes' as people who have understandably spent much of their own time on projects are a bit careful about who they share them with. Can I just appeal to anyone who reads this? ... History is for everyone ... it can be personal and private, and we should never ignore all the work other people put into their research ... but our lives are enriched by sharing. Just think about that when someone next asks you for your help or invites you to participate in a project in your community.